Can you eat an elephant? 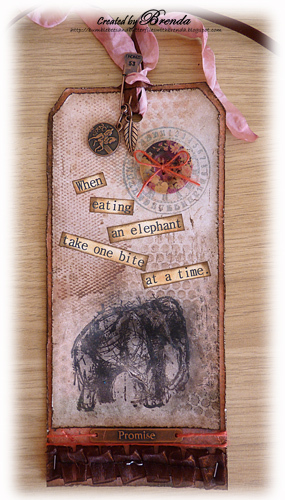 At PanPastelUK the theme this week is animals and I have made another of my extended tags, using Panpastels, stamps and masks to make the background and add the images. This is my second post for today and if you scroll down you will see a little Halloween box made for FSC. Stamps are Tim Holtz and the brown pleated ribbon arrived during the week from Linda at The Funkie Junkie Boutique, other bits are from my supplies and the sentiment is computer generated. The background was made in two layers using embossing ink with stamps and PPs, using glue stick with stamps and PPs and adding PPs through some sequin waste. If you join us this week you could be in with a chance to win a PanPastel started set from Your Creativity Store, and remember you don't have to use PPs to participate. Happy Sunday; have a great creative day. Gorgeous, Brenda....that saying is sooo true! beautiful tag and a great quote! Wow - I just love this, Brenda! Such beautiful pastel colours, and the elephant stamp looks wonderful against that beautiful background. I'm loving your tag-framed-by-a-tag technique - gorgeous! Great saying and great tag! oh this is fab.. i love that saying.. must remember to use it! Wonderful tag Brenda! Love the elephant & that fab saying! Love it from tip to tail! Great design! Thanks for playing the Go Dotty Rebel on RRD! This is a great tag, I love your background. Brenda, your tag is awesome! I love the design! Thanks for joining in the Use an Animal Challenge at The Crafty Pad this week! Very tongue in cheek Brenda and just love it! Fab creation. Amazing tag so very unusual and different just what blog land needs. 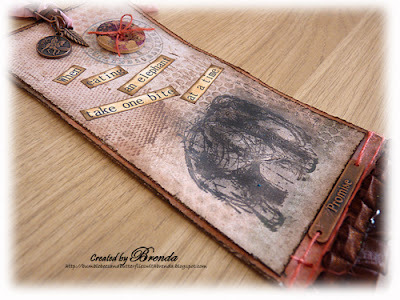 Great tag with lots of interesting elements from the stamping through to the embellishments. I just love that quote too - that applies to so many of us, so much of the time! You may note I'm on catch up with my comments - sorry! Those really are words of wisdom! I can't get over all you are able to achieve colorwise with the pastels. This is lovely! Oooh, this is just wonderful, Brenda. Your background is just fabulous - love the colors. 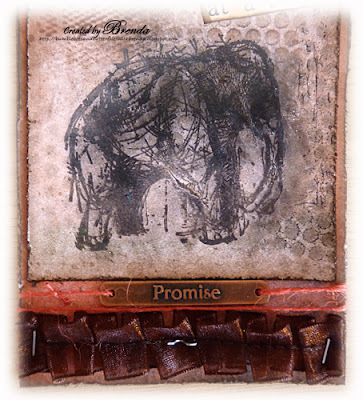 The sentiment is so clever with the elephant stamp! Just a delightful piece of work! Sorry I am so late getting around to thanking you for sharing in Sunday Share at Frilly and Funkie. I'm so thrilled that you played along and best of luck in the drawing!